Tell the Metropolitan Museum that Sacrilege is NOT Art! The exhibit includes many women’s dresses modeled after clerical attire worn by bishops and priests. Many of the dresses are transparent and extremely revealing. How dare they place the image of Our Lady, Mother Most Pure, on such an immodest dress, especially in such a revealing spot! Another dress to be exhibited is one which depicts a scene of Adam and Eve naked with a transparent top. Sadly, part of the exhibit displays over 50 vestments and sacred objects on loan from the Vatican from the Sistine Chapel’s sacristy. 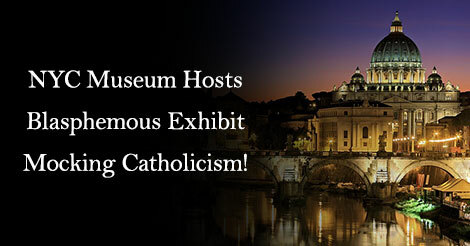 Cardinal Gianfranco Ravasi, President of the Vatican’s Pontifical Council for Culture approved of the Vatican’s participation in such an exhibit. According to Andrew Bolton, current Head Curator of the Metropolitan Museum of Art’s Costume Institute in New York City, states that the exhibit’s purpose is to express the influence of Catholic imagery on designers. This is not the influence of the Church upon the world, but of the world upon the Church! Immodesty, women priests and mocking Catholicism is not part of the religion Our Lord Jesus Christ founded! The exhibit sinks even lower. It is a dress, which looks like papal vestments, with a miter and a narrow waistline. This is sacriligious and must be stopped. To mock Catholicism is not art. Defend the dignity and honor of Holy Mother Church. Sign here to stop this Sacrilege. I ask that you cancel the exhibit Heavenly Bodies: Fashion and Catholic Imagination for the immodest, impure and absolutely blasphemous pieces to be exhibited. The purity of Mary the Mother of God is mocked by placing her image on immodest dresses, the doctrines of Catholicism are mocked by showcasing women’s dresses in the form of priestly vestments, and above all, John Galliano’s women’s dress that portrays his idea of a pope is absolutely wrong! I ask that you respect the Catholic Church and cancel the exhibition, which falsely expresses the influence of Catholicism. Catholicism influenced the world towards virtue, not vice and immorality.